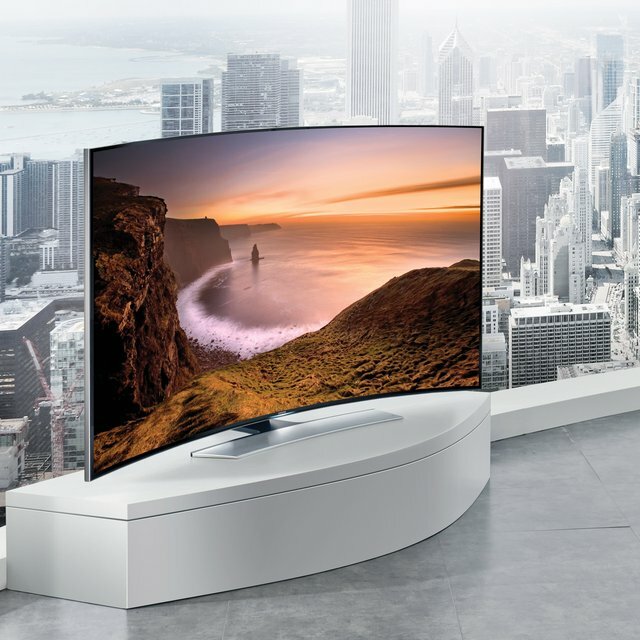 This Samsung 4K Curved Ultra HD TV measures 65 inches and features cutting edge technology to give you the most crisp picture available in your home. A 4K display allows you to watch content at 4 times the resolution of normal Full HD. Enjoy all of your current TV shows and movies in amazing detail! The Auto Depth Enhancer automatically adjusts the contrast by analyzing regions of each image, resulting in incredible detail and never seen before natural view. The refresh rate is 120HZ with a clean motion rate of 1440. The TV contains smart functionality with motion and voice control, using the built in pop-up camera. A Smart Hub organizes your entertainment into 5 panels, to help you seamlessly navigate your favorite content. The Quad Screen feature allows you to transform your TV into four separate screens that can access live TV, video clips and the Web all at the same time. Wirelessly beam your photos, videos, presentations, or video games to the big screen. The Samsung TV measures 57.1 inches wide, 33.4 inches high and only 4.4 inches thick. The available inputs include 4 HDMI 2.0, 3 USB, 1 Component, 2 Composite. The accessories provided include a Smart Remote Control, and 4 Pairs of 3D Active Glasses.